A political philosopher who fled Germany for Paris in 1933 and then New York in 1941, Hannah Arendt returned to Germany after the war to work with Youth Aliyah, which brought children survivors to what was then Palestine. Upon her return to New York, she reassumed her place in a vibrant community of intellectuals. 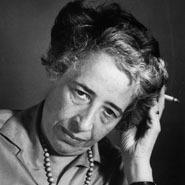 She came to prominence with her 1951 book The Origins of Totalitarianism, which explored the Communist and Nazi movements through a lens of antisemitism and imperialism. Future volumes dealt with issues of labor, moral imperatives, modernity, and political action. Arendt's 1963 reporting on the trial of Adolph Eichmann led to the controversial book Eichmann in Jerusalem: A Report on the Banality of Evil.